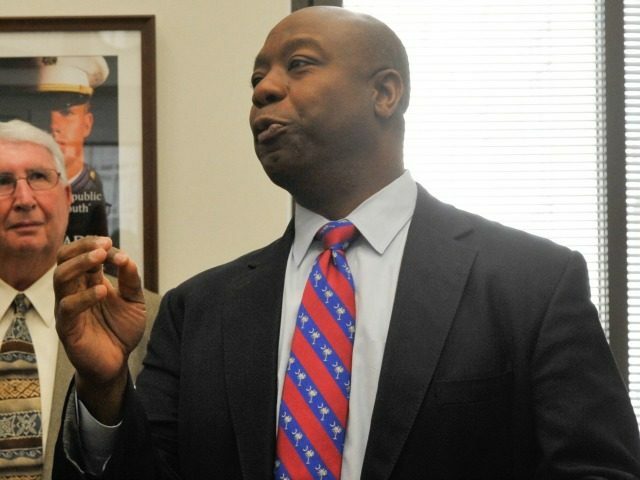 South Carolina Senator Tim Scott is firing a shot across the bow of Democrats accusing Sen. Jeff Sessions (R-AL) of racism. Sessions faces confirmation hearings regarding his nomination for U.S. Attorney General on Tuesday. “It is no secret that in 1986, Senator Sessions was not chosen as a federal judge,” Scott says. He succeeded Jim DeMint in the Senate, when DeMint left to lead the Heritage Foundation in 2013. “That is why even though I do not serve on the Senate Judiciary Committee, I have put a special emphasis on this nomination in terms of doing my own homework and determining the facts from the allegations. I owe it to the people of South Carolina, and the people of the United States, to make the right decision,” he said. “We may not agree on everything, but you would be hard pressed to find a nominee for any post that any Senator is in 100 percent agreement with,” the senator said. “”I have gotten to know Jeff over my four years in the Senate, and have found him to be a consistently fair person,” he said. Scott and Sen. Cory Booker (D.-N.J.) are the only two African-Americans in the Senate. Booker announced Monday that he would break with Senate tradition and testify as a sitting senator against the confirmation of a sitting senator. A Capitol Hill source familiar with Scott’s motivations for speaking out in favor of Sessions told Breitbart News Scott’s statement was not prompted by Booker’s break of protocol. Rather, the source said, Scott was motivated by his own friendship and working relationship with Sessions, whose reputation under an unfair attack. “After his nomination, I invited Senator Sessions to Charleston, South Carolina in December of 2016 to meet with African-American pastors, law enforcement and leaders of color,” Scott said. Scott said he would not weigh in on disputed allegations from three decades ago. Instead, Scott said he based his support of Sessions on what he knows is solid. Sessions understands the price paid by Americans for the freedoms protected by the Constitution, he said. “The United States Department of Justice is charged with upholding some of the most basic tenets of our Constitution, as well as laws that were forged through the blood, sweat and tears of generations of Americans, including many people of color,” he said. “As our nation endures racial and societal unrest like we have not seen in a generation, I know that whomever serves as our nation’s Attorney General must be committed to ensuring that those laws and tenets are fully enforced and protected,” he said. Sessions is scheduled to testify before the Senate Judiciary Committee Tuesday and Wednesday. He is expected to by “introduced” to the committee.by Sen. Richard Shelby (R.-Ala.) and Sen. Susan Collins (R.-Maine).